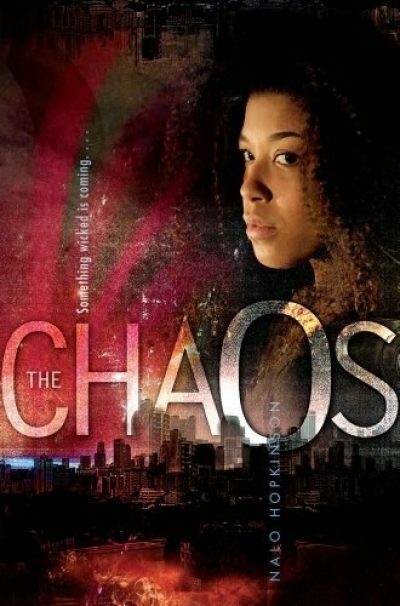 2012’s The Chaos is a standalone young adult urban fantasy novel by Nalo Hopkinson. Sixteen-year-old Sojourner Smith leads a far–from- perfect life; she knows it and she knows why. She’s too white to be black, too black to be white, and subject to her parents’ draconian discipline (the same inflexible standards that consigned her older brother to prison). School is something of a refuge: there, she is nicknamed Scotch and admired because she is pretty, flirtatious, and a star performer of the Raw Gyals dance troupe. Of course, nothing is perfect, and there are a few problems even there. She’s fallen out with Raw Gyals troupe leader and former best friend Gloria. Scotch is convinced that Gloria has her eye on Scotch’s ex-boyfriend Tafari. Not what a real BFF would do. Oh, and there’s Scotch’s new skin condition and the fact that she’s been seeing floating heads lately…. A night out with her older brother Rich sounds like a welcome respite from parents and school. Pity the Smith siblings picked the night all hell broke loose in Toronto 1 Welcome to the Chaos! The giant floating bubble that consumes Rich and half the club is just the beginning. A volcano erupts out of Lake Ontario; creatures straight out of myth and legend stalk Toronto’s streets. Even Canada’s famed Emergency Preparedness programs lack contingency plans for Baba Yaga’s hut, Horseless Head Men, and sandwiches that try to bite back. The citizens of Toronto rise to the occasion, as people do in crises. Find and rescue Rich, now a disembodied voice on the phone. Avoid becoming the latest in a long line of unpaid short-lived servants to the witch in the chicken-legged hut. Avoid being eaten by her aunt’s dog. Well, not so much a dog now as a ravening monster. As would any Kitchenerite with basic common sense, I was curious to see if the author ever addressed the impact on the economy of Southern Ontario of having Toronto, the engine of Ontario’s economy, disrupted by the sudden appearance of a volcano in the lake 2. Hopkinson implies widespread disruption, but lacks space (this is a short novel) to go into the details. Would Kitchener’s Oktoberfest be impacted by the destruction of a good part of Toronto and the deaths of thousands? This novel does mention Guelph. Guelph is the Jan Brady of Canadian cities, so it is nice to see it get acknowledged even in passing. Guelph’s significance to the novel is that it’s super-duper white (more than 80% white). Demographics is one reason the Smiths decided to move to Toronto. Toronto is considerably more diverse than Guelph. Not that that is hard. A detail that will mark this novel as Canadian to the informed reader the way that Torontonians are shown as reacting to a supernatural calamity. In scenes that could come from A Paradise Built in Hell, Torontonians rescue each other, set up relief kitchens, and generally act like decent people. It’s the same behaviour we saw in the blackout of ‘03, the ice storm of ’97, and in New York after 9/11. It’s how people react and anyone who claims differently—who, for example, thinks their neighbours are one mishap away from becoming rampaging cannibals—has an agenda that bears very close critical examination. Not all of Scotch’s problems are caused by her parents, her school, and the visiting volcano. She is shown as quite capable of complicating her own life. She’s oddly oblivious to the internal lives of others … even of the notion that they might have such lives. She’s also secretive. There are good reasons for that, but it also means that she hides distress and does not ask for help. Her friends would help … if they knew she needed it. Nor do they have any idea why she does some of the odd things she does. The Chaos is available here (Amazon) and here (Chapters Indigo). 1: Toronto is a city in Canada. Just in case there are any Americans reading this. 2: I was a lot more bothered by the idea of a volcano forming in a region that has no business having volcanoes (plate tectonics!) than I was by the idea of Baba Yaga’s hut stomping up and down Yonge Street. I have no sensible justification for this.